NEW YORK (CNNMoney) -- Zynga, creator of the -Ville online gaming franchise, filed Friday to raise up to $1 billion in an initial public offering. Unlike many of its fellow much-buzzed-about Web upstarts, Zynga is solidly profitable. In 2010, the company had a $90.6 million profit on sales of $597 million, according to its SEC filing. In the first three months of 2011, Zynga earned $11.8 million on sales of $235.4 million. Zynga said it has 60 million daily active users, who collectively spend 2 billion minutes each day playing its games. Competitors include Electronic Arts (ERTS), Disney-owned (DIS, Fortune 500) Playdom and PopCap Games. Research firm eMarketer expects overall U.S. social gaming revenue to hit $1.1 billion in 2011, up from $856 million in 2010. Zynga has a strong balance sheet: It's holding nearly $1 billion in cash and liquid assets. The four-year-old company has raised almost $520 million in venture capital funding, according to CrunchBase. The company didn't say how it plans to price its shares -- that is typically determined just a few days before the IPO -- but private stock sales this year have valued Zynga at more than $15 billion. How Zynga makes money: Nitsan Hargil, director of research at GreenCrest Capital, told CNNMoney recently that Zynga is "in a completely different category" than most of its unprofitable peers -- thanks to stronger financials and multiple revenue streams. Zynga gets revenue from its users paying real money for virtual goods, like tractors and animals for their online farms. Zynga noted in its filing that it relies on this "small percentage of our players for nearly all of our revenue," but it didn't break that figure out separately. The other revenue stream is unique advertising -- like Starbucks (SBUX, Fortune 500) paying to have a virtual coffee shop in CityVille. Users might have to visit that virtual store 10 times in order to build a Starbucks franchise in their own virtual cities. These business methods are a far cry from Zynga's past, in which it resorted to spammy and scammy tactics to gain new gamers and monetize existing ones. Facebook users became so frustrated with Zynga notifications clogging up members' newsfeeds and dashboards that Facebook decided to expressly prohibit the practice in early 2010. And existing Zynga users found themselves flooded with offers to try shady third-party "partner services." Zynga acknowledged the Facebook crackdown in its filing, noting that the change caused Zynga's number of Facebook users to decline. Zynga also noted that Facebook is its "primary distribution, marketing, promotion and payment platform," so it could be "unfavorable" if Facebook alters its terms in the future. 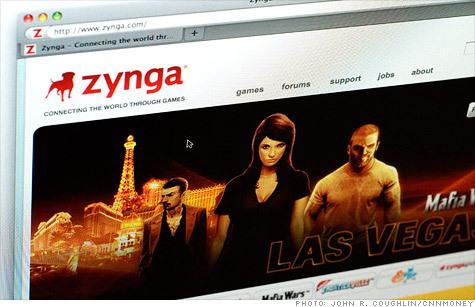 Zynga said it has a contract with Facebook in place through 2015 governing its service terms. The deal requires Zynga to use Facebook's own currency, Facebook Credits, as its primary payment system. Facebook keeps 30% of the revenue from those payments, and passes the remaining 70% on to Zynga. Some of Zynga's creators have already cashed in on the company's success. CEO and founder Mark Pincus, who currently owns around 16% of the company, collected almost $110 million in March from selling part of his stake back to Zynga. The company also repurchased shares this year from some of its venture capital backers. Union Square Ventures made $46 million selling shares, while Institutional Venture Partners, Foundry Venture Capital and Avalon Ventures sold stakes of around $20 million each. Kleiner Perkins made almost $6 million from selling shares. Each still holds a significant stake in Zynga. CEO and founder Mark Pincus took home a $300,000 salary in 2010, plus a $135,000 bonus. As of March 31, Zynga had 1,858 employees -- 64% of whom have been there less than one year. More than 90% of Zynga's staff has been with the company for less than two years. The underwriters of Zynga's IPO are Morgan Stanley, Goldman Sachs, Bank of America, Barclays, JP Morgan and Allen & Co.